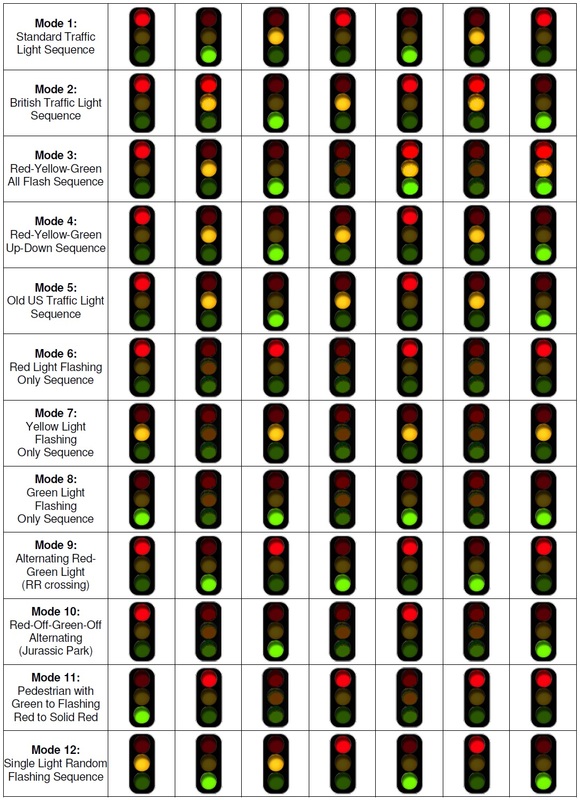 NEWLY improved with the latest in solid state technology, our AC Traffic Light Controller is the perfect solution for all of your traffic signal needs. Accepting standard 120VAC line voltage (240VAC available), this controller provides over 500 Watts of power per channel and will drive full-sized LED and incandescent traffic lights (This includes all household bulbs). Solid state outputs also means both inductive and non-inductive loads can be switched effortlessly for years. 25 thoughtfully considered sequences have been packed into the microcontroller and are easily selected with the push of a button. The unit comes with quick installation instructions and four (4) adhesive standoffs for effortless mounting on virtually any surface. Select Accessories above to add a power cord. Easy to program mode selection with pushbutton control. 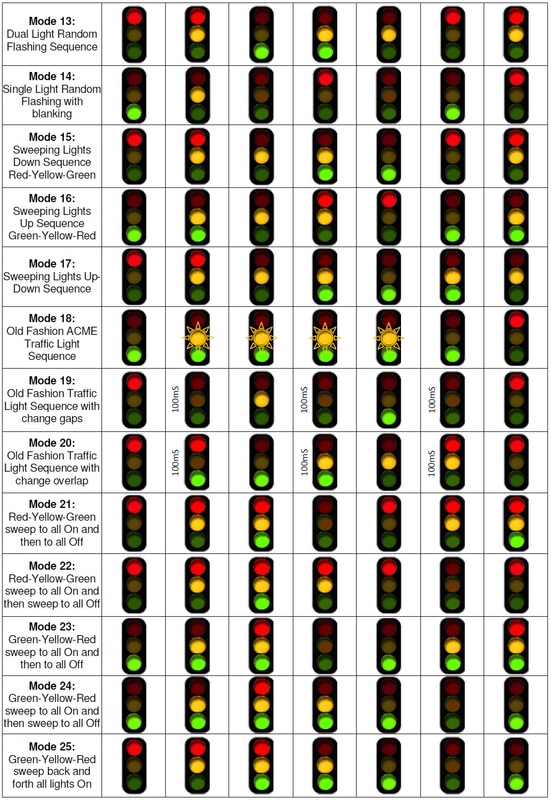 25 unique light sequence modes including 12 realistic traffic modes. Separate digital control for "YELLOW" allows for realistic operation (3 to 8s). User selectable time delay from 1 seconds to 2 minutes (determined by mode). 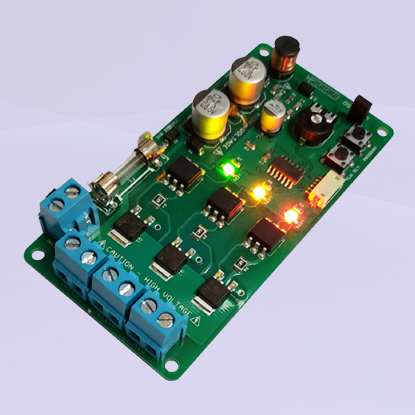 Wide input voltage range, accepting from 90 to 130VAC with input fuse protection. Highly efficient power conversion draws less than 0.5 watt from the logic side. Independent outputs channels for operating LEDs or incadescent lamps. Solid state switching for silent operation (no clicking mechanical relays). Snubberless™ technology to protect against reverse voltage spikes. Onboard LEDs to show current output states for easy programming and setup. Compatible with all traffic lights & bulbs (non-dimmable LED bulbs included). Four adhesive standoffs to allow for effortless mounting. Please observe all applicable electrical wiring codes when utilizing this product. Additionally, this device is fused with a 5A/250VAC fast acting fuse. Replace only with an equally rated UL approved fuse. The user understands that Galak Electronics is not liable for any damages (including shock, fire, property damage or death) due to the improper use or installation of this product. Please contact us before bidding if you have concerns about safe and proper installation of this product.